I’m a newly retired lady traveling with my old cat. I’m autonomous in my class B Van. I love people and I’m very enthusiastic about learning and sharing my traveling experiences. This is the second time Carole has stayed with us. 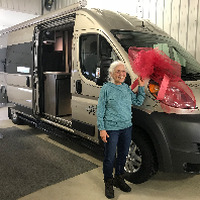 We hope she makes our place a regular boondocking stop when she travels to and from the south. We thoroughly enjoyed her company. She is such a nice person with interesting stories. 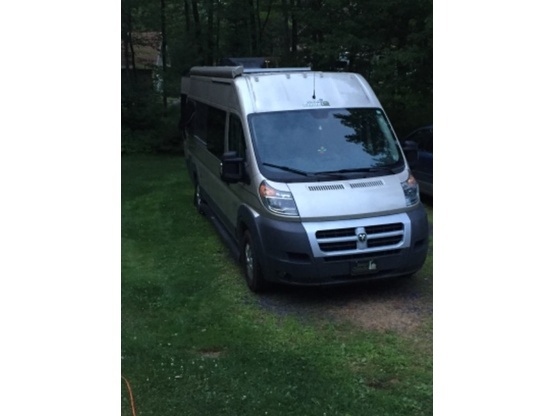 We highly recommend her as a boondocking guest. It was such a pleasure to host you and get to know you. Your kind and musical spirit touched us and we hope we will meet again. Carole Is definitely a great guest & we look forward to more visits from our new friend as well as other Boondockers in the future. We really enjoyed Carole's visit. She was a neat and considerate guest. Carol was a great guest. She is very personable and talented. We already look forward to her spending time with us again next year when she comes back through this part of the country. Great lady who is living the life style. We loved the time together and we just wish she would turn around and come back now rather than wait until next season. We enjoyed the cat and we think he enjoyed it also. Either one or both welcome back anytime. Very sweet lady, loved having her here. We all enjoyed having her visit. An hope to see her at around the country again. Carole has become a true friend. Kind caring and respectful. She is always welcome at my place. Carole is the best! Kind caring and a wonderful guest. She has been here twice and I hope she returns again and again. great lady plays the flute beautiful. Enjoyed meeting CaroleC. She was so quiet, we barely knew she was here! Always welcome back. Carole was a wonderful guest, and very interesting. We really enjoyed her company and will look forward to hosting her again in the future. Carole is a gem. A great guest and someone who is always welcome back. Carole sounded interesting during our brief phone conversation. We weren't able to be at our workshop/storage place during her stay but, she said she was able to hook up and get what was needed for one day stay. She left no trace she was here. Perhaps we will meet another time. Carole stopped in on her way down from Canada, and we had a wonderful visit. We shared a big bonfire along with our other guests and Carole played her Indian flute for us. She is very talented and super sweet! We wish her the best on her travels and hope to see her again. Carole is as sweet, gentle and fascinating a guest as you could ask for. Welcome back any time... If you are lucky, she'll play some music for you. "My daughter said Carole was a nice lady"
Sadly I had an emergency that took me away during Carole's visit but my daughter took over. She was very pleased to tell me That Carole reminded me very much of her grandmother who had backpacked around the world with my father and after he died often took trips alone. I wish I had been here to hear her stories because that is my dream, to take off in my little RV. I sincerely hope she returns here again so I can visit with her. Awesome, fun and interesting guest! Carol was a pleasure to host. She was fun to talk to and great company. She had some great health advice roo. Hope she comes by again in the future! We very much enjoyed hosting Carole and Bagheera (her cat). Carole is a kind, interesting and generous person. We look forward to hosting her again sometime. Lady Pelgrim, is a nice boondocker to have as a guest, would received her anytime.